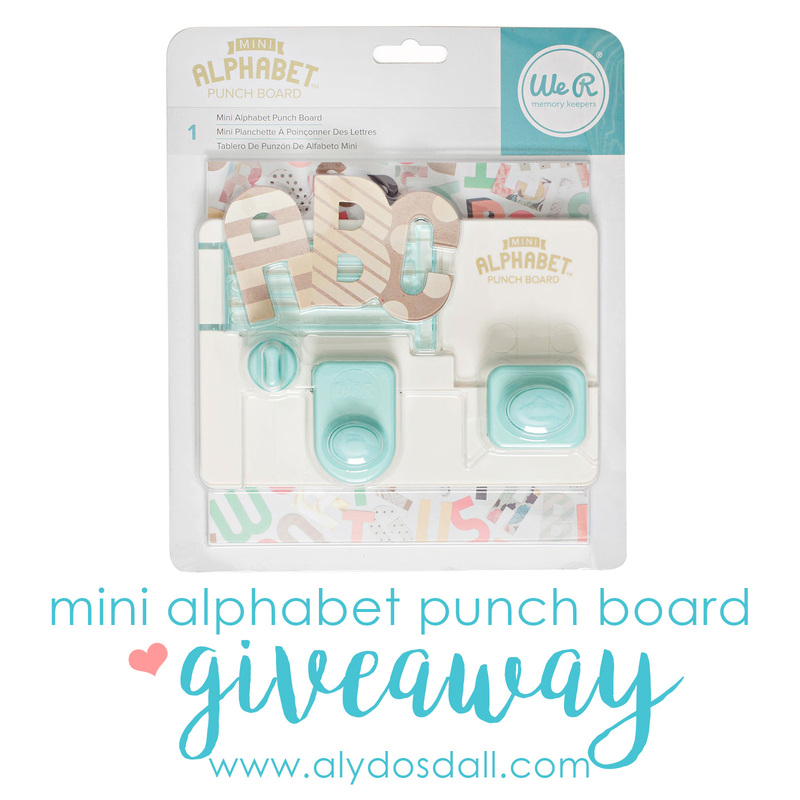 Aly Dosdall: mini alphabet punch board giveaway! mini alphabet punch board giveaway! Recently we announced the release of the new We R Memory Keepers Mini Alphabet Punch Board on the We R blog. While I love the larger board for parties and decor, this mini one is perfect for so many different projects. I just can't get enough of this cute thing, so I thought I'd share the love and give one away to you wonderful readers! The Mini Alphabet Punch Board is just like it's mama, the larger Alphabet Punch Board, and can make all letters, numbers 0-9, and a couple of punctuation marks. The letters are 1.5" x 2.5" and are perfect for cardmaking, scrapbooking, project life, planners, and other small scale projects. Come back on Wednesday for more project inspiration and an overview video of the tool. If you'd like to be considered for this giveaway, please leave a comment below telling me what projects you would make with this fun little tool. Comments will remain open until Thursday, July 21st at midnight. I'll select a random winner and announce who that is on Friday morning, July 22nd. Please be sure to check back to see if you won! Good luck! ETA: This giveaway is now closed. Thanks for entering! I would use it to make cards and scrapbook pages. Thanks for the chance to win. I would use this for greeting cards! I would make all kinds of greeting cards!! I have the original alphabet board, but the letters are too big for an a2 size card! Thanks for the chance to win! First, I have a love of tools. Second, I have the larger ABC punch board. I have 6 grandkids and they love mini banners and cards with their names or initials. And, I have been making scrapbooks for each. This is just the right size! I love my alphabet punch board and was thrilled to see that there was a mini one coming out. So versatile! Thanks for the chance to win! Scrapbook pages probably mostly .. cards, tags, banners, DIY party decor .... The concept is absolutely brilliant. WRMK has some of the most innovative products. I teach crafts to kids and although I could do any words I want on my digital cutter. It is impossible to guess which letters and words the kids would want. Any time I bring punches the kids love it, and I think this alphabet would be as amazing!! So cute! Definitely cards and home decor! This mini alphabet punch board is such an amazing idea by WRMK! I would love to use this on my cards, money wraps, gift boxes, gift tags and much more! Wouldn't this make the cutest initial tags for gifts. I would make them in my kids name initials and attach them to Christmas presents. So fun, I would love to see what I could create with it!!! I would love to win this! I would use it to create letters for cards, mini albums, and small banners. What a great tool to have! I would use it for cards, scrapbooks and labeling. I'm sure my granddaughter could think of endless ways to use the letters. She loves to play teacher. I would use it for scrapbook pages. Thanks for offering the giveaway. What a great give away! Thanks! I would use this board to make cards, scrapbook pages, and labeling stuff in my craft room. This might even motivate me to organize my craft room! I would use this mini letter punch for cards, Scrapbook titles, and in my planner for pops of pretty patterned paper-yes, please! Looking forward to your video for other ideas of how to use this new tool. Thanks, Aly! I would definitely use the mini punch for scrapbook pages...but how crafty it would be for cards, too!! This would be amazing for party banners! So excited!!! I would defiantly use this mini alphabet punch board in my scrapbook projects. I would love to win! Thanks for the opportunity! This is so awesome!! I would love this for scrapbook titles, for bold cards and for cool tags and bookmarks! I love this! I have a few of We R memeory keepers cutting tools, the envelope one is my favorite but this alphabet punch board is even better, I can see lots of possibilities, the size is actually perfect for a lot of things, cards, tags and my project life journal page. Awesome! The punch boards are amazing. Would love to add this to my collection. I would personalize cakes & cupcakes making banners. Love the punch boards....no electricity!!!!! Yeah!!!!! I need it for scrapbooking and cards. I am working on a huge scrapbook project right now. My son passed away 17 years ago and this year he would have turned 50. I am creating albums of him when he was young for his son, my grandson, who was only seven when his dad died. I love using the same alphabet throughout the album to tie everything together. Can't get enough of WRMK products. I would use it for cards and make letters for my daughter. I would make all the projects! I scrapbook, make cards, decorations, and the kids always have school projects the mini alphabet punch board would be useful for! I would definitely use this for my scrapbook pages and for making banners and cute stuff for my sons nursery. I would love to get this! I would use it to make cards but I can think of so many other uses too! Thanks so much for the chance to win! I would make lots of things! Cards, signs, notes for my family! I would use it to make cards and in my happy planner. This would be a great tool to use to make cards, banners, and scrapbook pages. Oh my goodness, this could transform my scrapbooking! Not to mention other crafts...thank you so much for the chance to win! how fun is that unit. I'd use it for initials on scrap pages, cards.. mini banner. When this came out I knew I REALLY needed it! 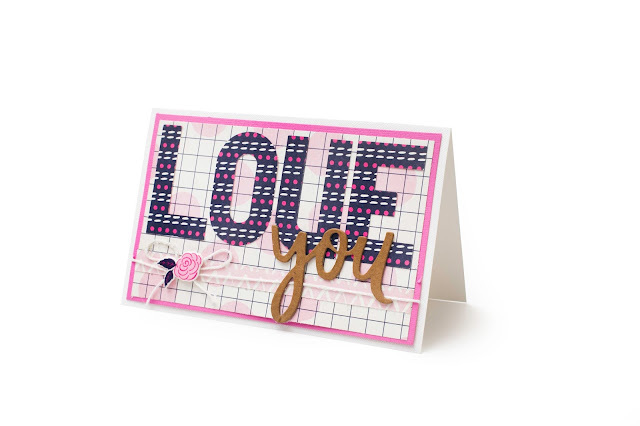 I would use it for titles in scrapbooks but not only that, I love the idea of using it for cards with short words like the sample you have that says "love" you with the mini alpha punch letters used. I can think of a bunch of ideas like happy "bday" or "congrats" in a 5x7 card, and "miss" you, or even thinking of "you". So many ways to use it. Thank you for having this contest!!! I would give this to my daughter. She makes cards and just got hired to be a teacher. I'm sure she would love this! Oh! The possibilities are endless with this! I would make alphabet banners for the classroom, name banners for my little guys and gals rooms...even an alphabet book! Thanks for the chance! I would love to make cards with this. Would love this to use in my card making and will no doubt buy it if there is any money left after the expo. For me, I would make banners, mini for the car abc books, cards & scrapbook layouts..Oh so fun looking..
Would love to use this on pocket letters and flip books. I would use this punchboard for all my crafting! Banners, cards, pictures, and prints, and so much more! I love all the WeRmemorykeepers keepers tools! I would use this for scrapbooking and punching words that match for that page and my kids sure would be punching out alot of words for there crafts and cards that always make. My girls are 7yrs old and 5 yrs old they got the crafting from there grandma it's so fun. I would love to win this punch board! I have the larger one and it is awesome! I would use the smaller one for card making, scrapbooking, & smaller scale crafts in general. Can't wait to get my hands on one! I have the first letter punch board and LOVE it. I want this one also for smaller letters to fit on cards. I have the larger one and it's great. I would use this one for my scrapbooking layouts. Thanks for the opportunity to win. My daughter spent most of her life in surgeries and hospitals. She is very delayed, so I am helping her in many ways. I thought to prepare for her a daily program with all the things she needs to do everyday, her routine and I will use the mini alphabet punch board to write everything down and this way she will also learn to read (she is entering kindergarten). I will also use it in some flash cards for her and of course use it for scrapbooking, which I recently discovered and fell in love with. I love making card in mixed media form. I would love to use this to make the monograms for the cards. Awesome giveaway! There are so many FUN projects to use the Mini ABC Punchboard! I would use it for cards, scrapbooking, journaling, banners, decorations for parties and more. Thanks for the opportunity to win! Thanks for the giveaway. I would use the Mini ABC Punchboard to make cards, tags, bookmarks, boxes, and other gifts. I'd love to use this for my scrapbooking projects! I'd also loan it to my friend so she could use it for the bulletin boards at church! The first thing I would create with this would be number and letter flashcards for my 4 year old granddaughter! We need to work on letter and number recognition and this would be a perfect way to craft together and use to play lots of games to make the learning fun! Win-Win for both of us!! After that cards, banners and making my own sentiments for mixed media and altered art projects! Thanks for the chance to win this!! Fingers crossed! My head is full of lots of ideas seing this machine. I love it. Thanks for this possibility. I have a young girl I'm getting started on doing paper crafts. I would give it to her. I would use it for my card making & for doing fun crafting projects with my 5-year old grand daughter! I would use it to create my first Faith Scrapbook. The Mini Punchboard would make it so much easier to include key words in a given bible verse. I believe the statement would be...what wouldn't I use the board for. I would use the letters and board for everything, from centerpieces to decorations. Not just letters for scrapbooking and cards but flowers, butterflies and all sorts of items that can be made with the board. I can help my grandson with his learning but also the posters we use at church. Love that these are a small enough size to use on cards and ATCs! I'd have a ball coming up with ideas for that! Very fun! Love I! I would make banners and cards with it! Ah, love love love wamk!! I have the evolution advanced, best die cutter ever!! I would use this amazing tool to, of course, making cards, will be great for banners, but i think most of all id use it for creating cute things for my gkids, and their school classes!! Their teachers really aporeciate the help! I'd make cards and scrapbook pages and wall art. Looks like a really clever punch board!! All my birthday cards, anniversary cards, and any kind of celebration cards, e.g. "You're my #1" etc. I can think of so many use and I love this cute smaller size! hermosa herramienta que me encantaria tener!... soy de mexico y no se si entre en la rifa, pero no quise dejar pasar la oportunidad de venir a decir que me encanta !! Love this!! ❤️ I would make my cards with this. This is great! I use the large board to make banners, the small one has so many uses, first I would like to make cards, but ideas for many other projects. Thanks for the opportunity to win one. I love making banners,so this would be perfect!!!! This giveaway is awesome!!! I have the original Alphabet board and I use it to make letters for my bulletin boards and banners for school functions or events. At the end of school I made a banner that said Happy Graduation and used it as a photo op! The mini alphabet punch board would allow me to use the letter within the students' work, on my card projects and in scrapbooking! What a neat product!! I would use it for scrapbook titles on pages for our family vacation to Florida this year. And for tons of cards!! My 7 year old daughter and I would love to win one of theses.. We would use to make school projects and create more scrapbook pages. My daughter wants to make her whole class Christmas cards. This will be our first time Making so many cards. This Alphabet punch board would come in very handy.. Thanks for the chance of winning!! I would use this for scrapbooking and with my son for school projects. Such a cute tool! I would use it for scrapbooking and for school projects. Tired of the letters I have and need to continue my daughter's swimming history scrapbook. And of course will use for her school projects too!